Those are two very different numbers. The first one is equal to 27^27 (39 decimal digits) which is much smaller than the second number (3 638 334 640 025 decimal digits). Since each digit is a nibble (4 bits), there is not enough memory to hold all the digits. The order of operations (due to the explicit parentheses) makes the difference. True, I did not pay attention that parentheses work even in the exponential case. I'm doing too many basic errors, not good. (03-28-2017 06:13 PM)pier4r Wrote: Could you explain (or hint a known relationship) how did you get that d/2+x = d/2*sqrt(2) ? The following picture should say it all. Log in and click to enlarge. (03-29-2017 07:54 AM)Dieter Wrote: Right you are! Neat image, which tools did you use? Anyway, following the recent pattern, I guess I'm missing something obvious here. I can determine almost all the angles but not the wanted ones. (03-29-2017 11:04 AM)pier4r Wrote: Thanks Simone. Have you considered the sum of the angles in a triangle and a quadrilateral, and properties of vertical angles? (03-29-2017 11:31 AM)Han Wrote: Have you considered the sum of the angles in a triangle and a quadrilateral, and properties of vertical angles? Yes I considered the angles in a triangle (180) and quadrilateral (360), I considered that an angle is the same when opposite or the complementary that have a sum of 180. Unless I missed some internal shape, I got all the possibilities of which I'm aware of. What I did see after your question is the concave pentagon. And maybe this will help. (03-29-2017 08:48 AM)pier4r Wrote: Neat image, which tools did you use? This was a quick job in OpenOffice Draw, exported as PNG. So \(\angle BED\) , \(\angle BDE \), \( \angle CDE \) and \( \angle AED \) should be the only angles whose measure you cannot determine directly from the properties mentioned. What if you set up an appropriate system of equations involving these angles? That's not hard, I could write down my marvelous little proof but this text box is too narrow. My Hp 50g is actually computing since 10+ hours (and I dread that it will take days to finish) so I cannot readily try the suggestions of Han. (It still has to go through some modifications, I decided to collect the results for the round robin format but, after testing for 2 repetitions, I could not imagine such lengthy process and I cannot estimate when it will finish too. So it may finish in the next minute. This is a clear example why my low quality batteries last few hours. Holy usb chargers directly from the power outlet! @ You may edit the T(0)A(D)F(.) parts. 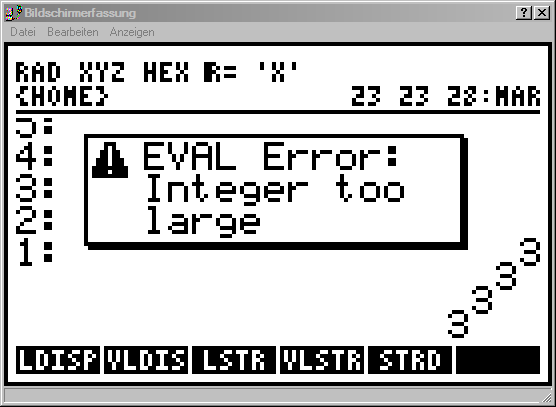 @ The earlier parts of the line are used by Debug4x. @ in npp, just select language "normal" to get rid of the highlight. @ what is the one that determines the best team. @ should be done some times to determine the percentage of winning for each team. @ 1. round robin. Every team meets everyone else, at least twice. @ Often used in long tournaments. @ This is assumed as the best format and will be used as reference. @ with high score, if possible avoiding pairings already done. @ The minimum is that teams meet once. @ Often used in chess, short but maybe effective. @ the ones that wins proceed. @ Often used in "show tournaments", short but maybe not so effective. @ Often used in show tournaments. Short but maybe not so effective. @ be different from the actual code though. @TODO: to pass variables between programs, try to use the compiled local variables. @ so one does not have persistent variables after the execution. @ trial. It is like using inputs, without having to type them on the stack. 0 @tmpV to use for short time, value can be changed in other functions! @remark: to recall and put in local var only when speed is needed. @final matrix with cumulative probability, probability, variance results. @repeating the same tournament type to get the winners. @ every drop or increment of the base strength is made in 25 points. @ base value then goes back. +25 has 400 tokens, +50 has 375 and so on. @ so I want to model those tokens. @ Or REVLIST could have been used. @ the complete list now goes from 25 to 425 and back to 25. @ they are unreadable but when they are a few it is ok.
@ otherwise one should comment the actions that they do. @ counter, it needs to start from 1. @we need to count the objects that we leave on the stack. Plus 1 added at the start. @before making a vector out of it we save the last value that is the maximum value. @ the number of objects. @final matrix with columns: sum of probability tokens, probability tokens for variance, variance in points. @accessing the matrix in algebraic mode, slower but more readable. @maintenance and debug use resources as well that often are more valuable. @ found a probability sum bigger than the actual random value. @program to compute the result of a match based on the variance and probability of it. @ should be used by all the tournaments. @as for of variables already existing. @there is no draw possible, at least for now. @ program it gets too unreadable. @already named and set variables. @output, the list of teams with final points. @ After the discovery of the DIR END structure, I'm going to refactor the program. (03-30-2017 08:30 AM)pier4r Wrote: My Hp 50g is actually computing since 10+ hours (and I dread that it will take days to finish) so I cannot readily try the suggestions of Han. ?!? – *what* is it computing? Obviously this in not related to the triangle problem we are discussing. (03-29-2017 06:15 PM)Han Wrote: So \(\angle BED\) , \(\angle BDE \), \( \angle CDE \) and \( \angle AED \) should be the only angles whose measure you cannot determine directly from the properties mentioned. What if you set up an appropriate system of equations involving these angles? ...but I cannot get four independent ones, so there is no solution for a linear equation system. What do you get? I had not actually attempted this problem when I posed that quest. My question about considering a system of linear equations was merely that -- a question (i.e. was it tried, and does it work) -- and was not meant as an indication that I had solved it through linear systems. You are correct, though, that the resulting system is not sufficient for solving the problem (the system does have a solution; however it appears it has an infinite number of solutions assuming we are not restricted to whole degrees for the angles). I did eventually make some progress on this problem. I think I have a solution but I wonder if it is correct since it is not the cleanest. It is an elementary solution, but nowhere near what Paul Erdos would consider as being from "The Book." But what I ended up doing making use of the law of sines and cosines. Here's an outline of my solution. Let F be the point along CD such that AF is perpendicular to CD. G be the intersection of the blue lines. Observe that AC and AD are equal in length. Call this length L. Use basic trigonometry determine CF (in terms of L), which then gives you CD (since CD is twice the length of CF). The law of sines applied to triangle CAE will give you the length of CE in terms of L. Then use the law of cosines in triangle CDE to determine ED (again in terms of L). Lastly, apply the law of sines to triangle CGE to determine EG in terms of L. Now you can apply the law of sines to EDG to obtain the angle GDE (which is the same as angle CDE). I got approximately 76.32 degrees for the angle through a bit of scribbling (very likely I made a arithmetic mistake, I would imagine) and a basic scientific calculator (HP 32S). That's what I'd done too, but the solution is very simple, I realize now. No need to solve any linear system. PS: From E draw a perpendicular line to line AB, which intercepts it at F. Now we have two similar right-triangles: BEF and EFD. Angle DEF = angle EBF = 18 degrees, as we already know. Angle BDE, which you have named 'u' is its complement, 72 degrees. Finally, angle EDC, or your 'x', can be easily determined as 180 - 72 - 48 = 60 degrees. (03-30-2017 12:13 PM)Dieter Wrote: ?!? – *what* is it computing? I did a little search and I found out the swiss tournament format that is pretty neat, but I would have liked to know the statistical properties of this format compared to other formats. I started a comparison model on paper, using the sharp el 506w as random generator (and also for multiplications). I tested two or three cases and the comparison procedure looked promising. So I said, ok let's automate the process. But then something else happened and I put the idea aside. The other day I decided to resume the idea from my todos collection (note 1) and since I am also in a period where I'm trying to refresh and expand my user RPL / math knowledge, I decided to implement it on the 50g. So I was all excited (and I still am excited) that finally I could manage better a large structure in a single file without clumsy workarounds or multiple tabs. After some hours of coding and debugging (debugging on the hp 50g, I mean the physical one, takes time. Although I discovered a neat solution thanks to nested programs. See topic mentioned above) finally the code worked for the first tournament format. The round robin. So I did two iterations as tests and I did not detect major flaws (could still be that there are some, I hope not). So I launched 1000 iterations to get the statistics back. I launched them at 0:56 30.03.2017 , local time. 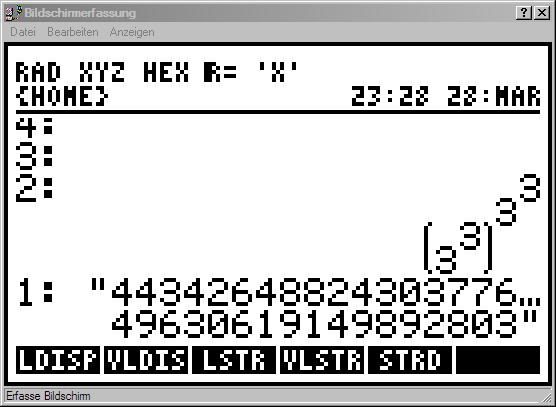 The calculator is still working (it is 20:09 local time). My fault was that when I launched the two iterations I did not take the execution time, I was eating. So I estimated some hours of work (at the end I still usel userRPL that is heavily emulated) but now I wonder if it will be finished before the weekend. I have to rethink about the role of the hp 50g, maybe it is not so suited for such tasks unless I go for hpgcc and hpgcc-based languages (I will likely skip sysrpl). I posted the code of the current working version of the tournament simulator in a previous post. I do not know if I missed obvious optimizations but I really thought that a tournament with 16 teams, so 240 pairings (120 pairings twice), repeated 1000 times would not take such amount of time. It is not the first time that I end up waiting hours/day on the hp 50 though. (note 1) About todos I do not know what the others do, but I try to collect my interesting todos. I always end up with more ideas than I'm able to process. I'm also pretty sure that there are plenty of people that have the same problem if not bigger (more todos than todos processing ability). Anyway at least I try to collect my todos, could be that someone will do it in the future. (03-30-2017 05:47 PM)Gerson W. Barbosa Wrote: That's what I'd done too, but the solution is very simple, I realize now. No need to solve any linear system. I suspected there had to be a simple approach. I'll try your hints and also rework my solution to see where I may have made mistakes. Quote: PS: From E draw a perpendicular line to line AB, which intercepts it at F. Now we have two similar right-triangles: BEF and EFD. Angle DEF = angle EBF = 18 degrees, as we already know. Angle BDE, which you have named 'u' is its complement, 72 degrees. Finally, angle EDC, or your 'x', can be easily determined as 180 - 72 - 48 = 60 degrees. Are you saying draw EF so that \( \angle BFE \) is 90 degrees? If so, how does it follow that triangle BEF is similar to triangle EFD without also knowing that \( \angle BED \) is 90 degrees (which does not seem obvious to me). 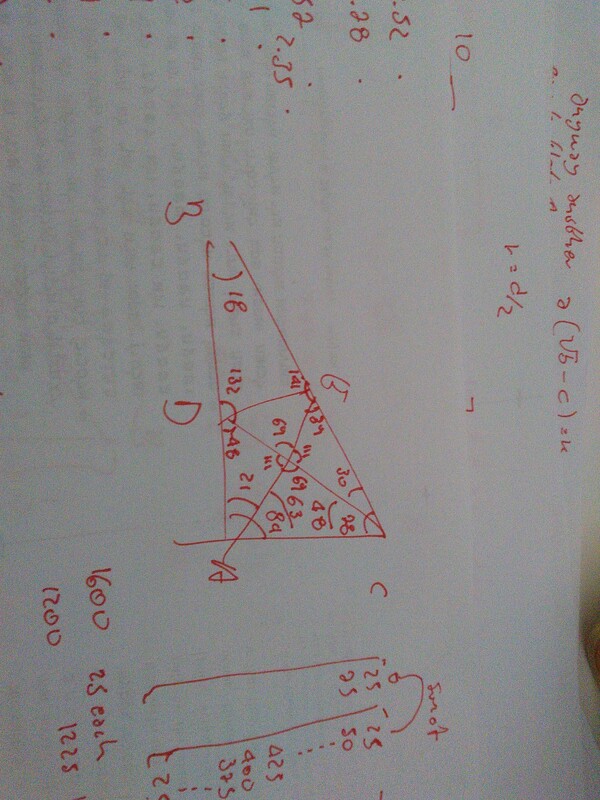 Or are you suggesting we make \( \angle BEF \) equal to 90 degrees? This would make it even less obvious how triangle EFD is even a right triangle. 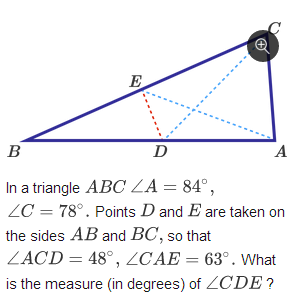 EDIT 2: Your solution seems to suggest that we only need angles A and C. Am I missing another simple observation ?